Dental Implants From £2150. Patient finance available. Take a look at our finance calculator to find out whether the treatment is affordable for you. 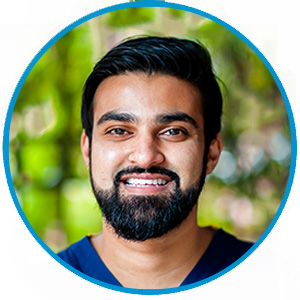 One of our dentists, Arfeen Aslam has a special interest in placement and restoration of dental implants. Dental implants are artificial replacements for your tooth roots that are placed within the bone of your jaw to help support dentures, crowns (caps) or bridges. Implants should provide you with a long lasting tooth replacement if they are cared for in the same way that teeth should be cared for. 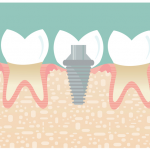 What happens during the placement of a dental implant? Treatment is normally divided into two or three stages, each of which may involve several visits to your dentist. Before implants can be placed, X-rays and impressions of your mouth will be needed. These allow us to plan the best way to treat you. You may require a cone beam CT scan and a small additional fee payable to CTDent who take CT scans on our behalf. The next stage of your treatment is to insert the implants. This is normally done under local anaesthetic (an injection which makes the area where we are working numb) by lifting the gum away from the underlying bone, then gently and carefully drilling into the jaw bone. The implant is inserted into the bone and the gum replaced and held together with some stitches. The stitches are removed about a week later. Following insertion, some types of implant will stick out through the gum, whilst other types will be buried underneath the gum. The implants will usually be left for at least three months before they are used to support replacement teeth. Implants buried under the gum will require a second small surgical procedure to expose them before they can be used. You will need a number of appointments to make your crowns, bridges or denture. This will include taking impressions and checking the fit of the parts used to make your replacement teeth. In total, treatment could extend over six to twelve months. Dental implants can be very useful where we would otherwise have to crown (cap) healthy teeth or where a denture or bridge would be difficult or sometimes impossible because there are no suitable teeth or gums for support. There is a small risk that the implants may not fuse properly with the bone in your mouth and so cannot be used. The risk is higher in certain individuals, particularly those who smoke, and you will be advised if we think the risk of failure is higher than normal in your case. Implant placement involves surgery in your mouth and so may be followed by some soreness, swelling, bleeding or bruising. Any discomfort is usually controlled with simple painkillers and should only last a few days. It is possible for parts of your implants to loosen or wear out with time. This can lead to failure of the implant, or the restoration on the implant, if not treated quickly. You will be responsible for the long term care of your implants and should arrange regular review appointments. Some patients who require implants do not have sufficient bone. In these circumstances it may be necessary to carry out a bone graft. This involves more surgery and associated swelling, bruising and pain. The risks of this procedure will be explained to you separately. With a bone graft, treatment may take four to six months longer. The available treatment options will vary a lot from person to person and so will be discussed with you on an individual basis. These may include no treatment, preparing other teeth for crowns or bridges or an alternative design of denture (if possible). We will inform you about your planned treatment in detail before we start. However, there are times during treatment when we have to change the planned treatment. If this is necessary we will make sure that you are told and give you the choice whether to proceed with the other treatment. If you are having sedation, we will discuss all possible alternative treatments with you in advance. If you have had the procedure under local anaesthesia you will be able to leave the surgery as soon as the procedure has been completed. You should be able to eat normally after the surgery but a soft diet may be advised by your surgeon. You should avoid alcohol for 24 hours. Implant patients are advised to quit smoking before starting treatment and to remain a nonsmoker in the long-term. You should be able to return to work within a day of your treatment. Occasionally you may not be able to wear your dentures for up to two weeks after the surgery. For the first week after your implant surgery it is not advisable to brush the area, therefore a mouthwash containing chlorhexidine (for example, Corsodyl) is recommended to keep the area free of plaque. You will be given more personalised advice following your treatment about looking after your implants. It is difficult to give an exact price as each treatment plan is entirely unique. Following a consultation you will be provided with a written treatment plan which will outline the steps and cost to getting your dental implant. To provide an approximate price range – a single dental implant starts from £2150. Implant retained dentures to replace all the teeth start from £4000 for the lower arch and £6500 for the upper arch. Costs and any additional charges will be discussed before you start the treatment and as the treatment progresses. See our price list Here for detailed information on the cost of dental implants.